n many cultures throughout the world, coins are a traditional gift to mark the birth of a new child. With their ability to mark a moment in time and their status as a symbol of wealth and prosperity, they have come to symbolise our greatest hopes for our children. In the past many of the themes have featured treasured Australian children’s stories - Dot and the Kangaroo, Blinky Bill, The Magic Pudding and Snugglepot and Cuddlepie have all been featured on these beloved releases. Their timeless appeal, imaginative content and positive messages have made them all fitting themes for such blessed events. 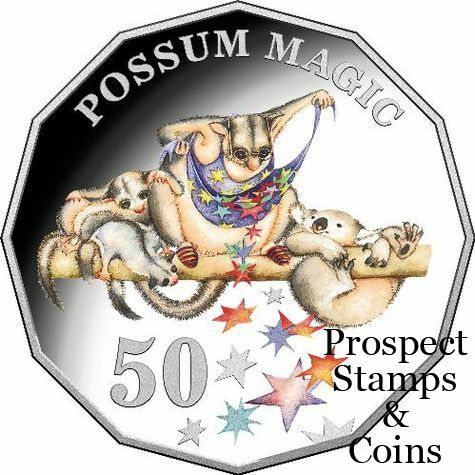 Since 1983, Australian children have been delighted by the Australian picture book Possum Magic. Mem Fox’s lyrical tale and Julie Vivas’ whimsical illustrations have taken readers on a journey around Australia’s capital cities, sampling Australian delicacies in a quest to find a special magical food. 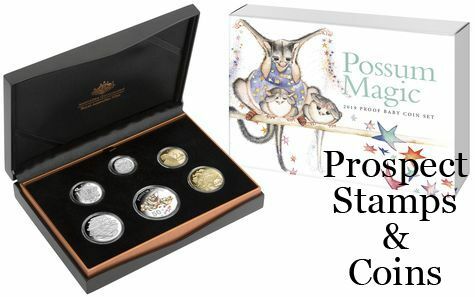 On the 35th anniversary of its first publication, it is a worthy theme for the 2018 Proof Baby Coin Set. Includes a family tree and a place to capture important birth details. Packaged in a 'Possum Magic' themed outer cardboard box.